Planning a foray? As with any outdoors activity, planning and preparation are crucial to success. Are you concerned about safety? (Where collecting edible fungi are concerned, this is of vital importance, but in any case there are always risks that need forethought and management. You will also be anxious to protect rare species and to minimise disturbance and avoidable damage to wildlfife habitats? These matters and many more are featured in this section on foray planning and management. Late summer, autumn and early winter are the best times for finding fungi, although there are a few spring species to look out for. Beech woods are without doubt a very rich habitat for fungi. Pine forests, especially where trees have been felled many years ago, are also productive. Finally, sheep-cropped meadows, parks and playing fields can also provide a mushroom harvest to those who get there first. And finally, make sure that everyone has a note of the date, time and venue (and perhaps a map, too). Maybe that is stating the obvious, but it's a great shame when poor preparation spoil what should have been an enjoyable day in the countryside learning more about fungi and the rest of the natural world. Some species of fungi are DEADLY POISONOUS, and edible fungi can easily be confused with poisonous ones if specimens are not thoroughly examined. Extreme care is therefore essential when gathering wild fungi to be used as food. If you are at all uncertain, show the fungi to an expert and obtain positive identification before eating them or giving them to anyone else who might eat them. Fungi of a particular species can vary tremendously in size, shape and colours. Before eating any edible fungi, make positive identification of several specimens. Young specimens rarely display the full range of identification features. Do not collect immature mushrooms that you cannot positively identify. Old mushrooms decay rapidly and can become infested with worms and grubs; they are best left alone. 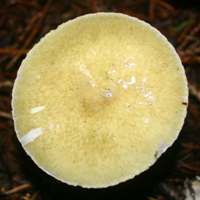 The Fungi Identification section of this website lists visual and other identification features for each species in the guide. The pictures alone are not sufficient, and it is essential to match up all of the features accurately. If a specimen that you find disagrees in even one respect with the details given here, it is best to assume that the fungus you have found is NOT the one illustrated and described on that page. If in doubt, leave them out. The content available on this Web site is for information and interest only, and we do not guarantee its accuracy or its completeness. Your use of the content for any purpose, including the identificatuion of fungi and selection of edible species, is entirely at your own risk. Fungus conservation is nowhere near as advanced (nor is is as commonly practised) as botanical conservation; however, some simple guidelines will help ensure that most of the fungi that you find are available for others to enjoy and as food or habitat for the insects and other animals that feed upn them or in some cases live within them! Where on earth can you tread safely? 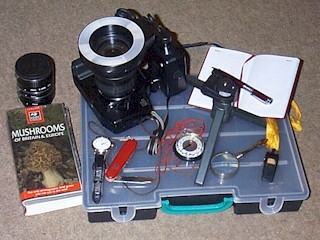 Using a tripod and cable release avoids camera shake and so permits slow (small-grain) film or digital images with the long exposure and small aperture settings necessary for good depth of field in natural daylight conditions. If your camera does not have a cable release facility, simply use the timer; unlike birds and insects, fungi are not noted for flying away in the few seconds between operating the shutter switch and the timer actuating the shutter itself! In dark woodlands, often the only alternative to using a tripod and long exposure is to rely on flash photography. Built-in flash usually gives a very 'flat' effect, can cause bleaching of pale areas, and sometimes casts shadows in the lower part of the image. A detachable flash gun, operating from the side rather than directly in front of the subject, can work well, but you may need a reflector to redirect some of the light from the 'dark side' of the subject. 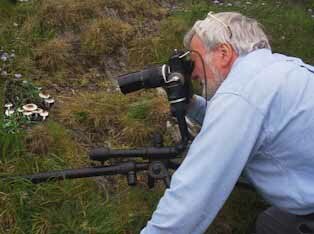 All this takes time to set up, of course, and the equipment must be carried; a tripod is often a better solution. On the subject of wild mushrooms that you can eat we stress, both in our Safety Guide and here in this brief introduction, that just as some plants and trees are poisonous (don't eat the seeds of Deadly Nightshade or of Laburnum, for example) some fungi are also deadly poisonous. If you plan on gathering mushrooms for food then you really do need to be very careful. Until you are 100% confident about identification, always seek expert help. Joining a fungus group is a very good way of learning how to identify not only some of the finest edible fungi but also, and even more importantly, the imposters that may be poisonous or hallucinogenic. If in doubt, do not contemplate eating a mushroom, toadstool or any other form of fungus. There are no old incautious fungus foragers: they die young. First Nature cannot accept responsibility for poisoning if you eat any of the species listed as 'edible' on this website; the absence of any mention of toxicity must not be taken as implying that a species is edible. That said, a few fungi species are both plentiful (so there is no real conservation concern as long as you take just a few rather than leaving the area bare!) and absolutely delicious. Mushrooms make a wonderful occasional treat. There are many other good edible fungi including for example Wood Blewits and Caesar's Mushroom (Amanita caesarea, which we find in southern Europe), and you will find edibility details on the species pages in our Identification Guide. Many kinds of mushrooms are edible, and some species are cultivated for sale; however, fungi are crucial in the production of many other kinds of food and drink including cheeses, wine, beer and bread. Shown on the left is the deadly poisonous Amanita phalloides, commonly referred to as the Deathcap, Death Cap or (in the USA) Death Cup. By any name it is a killer. There are several other toxic toadstools and there is no simple way of knowing which fungi are edible mushrooms and which are poisonous (or even hallucinogenic) toadstools. Ignore any suggestions that a cap that peels is safe, or that if animals can eat a fungus it must be safe for humans: these and many other myths have cost people their lives. You just have to be 100% certain in your identification before eating any fungi. Just as some plants and trees are poisonous (don't eat the seeds of Deadly Nightshade or of Laburnum, for example) some fungi are also deadly poisonous. If you plan on gathering mushrooms for food then you really do need to be very careful. Take no risks: if in doubt, do not contemplate eating a mushroom, toadstool or any other form of fungus. Here is a shortlist of some of the most deadly toadstools; if you eat them they can kill you unless you get very early professional treatment (sometimes the treatment involves kidney and/or liver transplants!). Amanita phalloides - Deathcap - probably the cause of more deaths from eating fungi than all other wild fungi species put together; but that is perhaps because it is such a common species and it can easily be mistaken for a Field Mushroom, Agaricus campestris, or other pale edible species. Get to know this one really well! Amanita virosa - Destroying Angel. 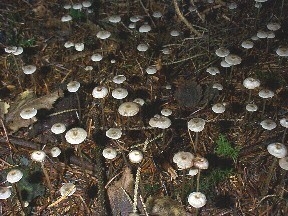 This causes the same problems as the Death Cap but is less common in Britain; it is very common in colder climes such as Scandinavia. Cortinarius Speciossisimus (= Cortinarius rubellus) and Cortinarius orellanus - treat all members of this group as seriously poisonous; some of them are just as deadly as the Deathcap (sometimes written Death Cap). If a cap-and-stem mushroom leaves rusty brown spore deposits, do not even consider eating it. Gallerina marginata - another relative of the Cortinarius fungi mentioned above, and just as seriously poisonous. Amanita muscaria - Fly Agaric - hallucinogenic and possibly lethal to anyone with a heart or respiratory condition or other major illness. Amanita pantherina - Panthercap (sometimes written Panther Cap) - generally considered more seriously toxic that the Fly Agaric (Amanita muscaria), so definitely not one for the lunch menu! 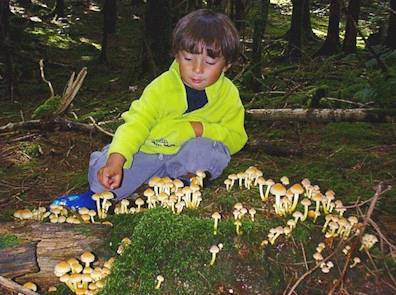 Inocybe erubescens, commonly known as the Deadly Fibrecap, has been known to cause deaths. Many other fungi in this genus are also poisonous, containing the toxin muscarine in much higher concentrations than occur in Amanita muscaria. All fibrecaps should be avoided when gathering fungi for food. 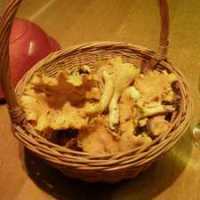 Only a small minority of fungi are poisonous, but many of the best edible mushrooms have toxic look-alikes, and some species are known to be dangerously hallucinogenic. If you suspect that someone has eaten even a tiny amount of a poisonous fungus, seek medical attention immediately, retaining a sample of the fungus responsible for the poisoning. Amanita fungi account for more than 90% of fatal poisonings in Europe. Amanita Phalloides, the Deathcap, is mistakenly gathered by people seeking edible mushrooms. The toxins in this fungus can destroy the liver, and even a single cap is enough to kill an adult. Unfortunately this is a very common woodland species, and on woodland edges immature Deathcap fruitbodies are sometimes mistaken for edible Field Mushrooms, Agaricus campestris. Amanita pantherina, the Panthercap, contains the same toxins as Amanita muscaria but in a very variable and sometimes much higher concentration. This uncommon species is sometimes gathered by people seeking the edible Amanita rubescens, itself rather a dangerous mushroom because it contains toxins that are not destroyed unless the mushrooms are cooked very thoroughly. Amanita virosa, the Destroying Angel, is infrequent in lowland areas but it occurs more often at higher altitudes. It is mistakenly gathered by collectors of edible Agaricus fungi such as the Field Mushroom, Agaricus campestris. Poisoning by Gyromitra esculenta, the False Morel, can be fatal. The toxins within this impostor are not all destroyed by cooking, and even when it has been cooked there are concerns that this fungus may cause cancer. Morels such as Morchella esculenta and Morchella elata have concave cap surfaces rather than contorted brain-like structures making up their caps. Most wild fungi are not poisonous, but those mentioned above are just a few that cause serious and possibly fatal poisoning. Many other toadstools can cause tummy upsets - sometimes very unpleasant - while others simply taste bad or are too tough to eat. Many edible fungi have lookalikes that are inedible and in some cases even poisonous. Of these six pairs of fungi, the upper species is a popular edible mushroom while below is an inedible or even deadly poisonous lookalike. Amanita muscaria is a dangerous and hallucinogenic fungus. Most of the toxic material is contained in the cap of the mushroom. Toxicity varies greatly between specimens depending on location, age of fruitbody and possibly also the age of the underground mycellium and/or the tree with which is is mycorrhizally associated.. At least one death has been directly attributed to poisoning by this very common species. Psilocybe semilaceata is one of several small fungi in this genus that bring on serious hallucinatory effects if they are eaten. This particular species grows in meadows, often on land that is periodically spread with slurry or where sheep dung has enriched the soil. That, apparently, is not enough to deter some people from tucking in to these tiny toxic toadstools! Those containing Psilocybin and Psylocin - for example Panaeolus foenisecii, Psilocybe semilanceata and Gymnopilus junonius. In structure these chemicals are similar to lysergic acid diethylamide, or LSD, a derivative of the fungus Claviceps purpurea, common known as Ergot, that infects grasses and most particularly rye grain. Individual people react differently to several kinds of fungi. What to one person may act as a mild stimulant can have far more serious effects on others. Hallucinogenic fungi are toxic, and some species can cause lasting damage. Poisonous mushrooms are brightly coloured; edible ones are pale or dull. Chanterelles and Caesar’s Mushrooms prove that this is untrue. Toxic toadstools smell bad and taste bad. No! Deathcap, the world’s most poisonous mushroom, is reputed to taste nice. If you can peel a mushroom it’s okay to eat it. Not so: some deadly poisonous species can be peeled. If slugs and other creatures can eat them it’s fine for humans to eat them too. Toxins can be harmless to other creatures but deadly for humans. Poisonous mushrooms will turn black if touched by a silver spoon (or, some say, vice versa). There is not truth in this tale… either way round! Cooking destroys the toxins in poisonous mushrooms. The most deadly toadstool toxins are unaffected by the cooking process.